Before dot-com bubble bursting in 2000, there were hundreds if not thousands of get paid to surf, get paid to autosurf, get paid to read emails, get paid to click, get paid to online, get paid to play games, get paid to sign up, get paid to promote, get paid to survey and many other get paid to websites (GetPaid or GPT) that pays and rewards users cold hard cash and money to complete certain tasks without joining fees or payment needed from members, primarily to watch advertisements. The icon of GPT programs, AllAdvantage, paid over USD $120 millions to its members before ceased operations, creating a craze to earn money from GPT programs among Internet users back prior to collapse of dot-com bubble. Now, AGLOCO (defunct) intends to imitate the success of AllAdvantage, albeit in much lesser scale. AGLOCO described itself as the first Internet based economic network, where members get a share of the Internet by allowing advertisers, search companies, online merchants and other businesses to pay AGLOCO members in order to get their attention and sell goods to them, instead of paying all ads money to the advertising agencies or publishers. To distribute related and engaging ads, yet allowing greater convenient and unobtrusive to AGLOCO members’ online activities, AGLOCO uses Viewbar that sits above the task bar on the desktop. 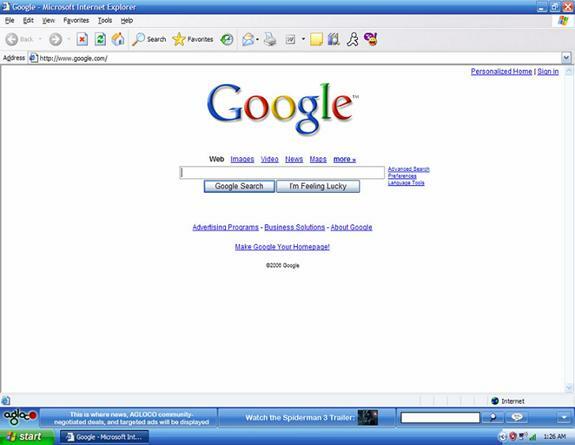 The AGLOCO Viewbar is much improved version compared with adbar or surf-bar that been used during the period of late 90s, in the sense that Viewbar has a concept similar to various toolbars been offered now from the like of Google, Yahoo! or Alexa, which features privacy protection, spyware protection, phishing protection, member universal IM, free voice phone communications, RSS feeds, broadcast communication, rich media, video, podcast, community tips, desktop search, web search, and of course, place to display AGLOCO community discounts and targeted text ads. The Viewbar can also be minimizing with just a single click. Viewbar is currently in beta development, and AGLOCO will notifiy once it’s available and released for free download. Once members install Viewbar, they continue to use the computer to online and browse the web as usual, and members will be paid for the time they actively online, for up to 5 hours a month (as of current limit). Beside, AGLOCO also pays members an hourly rate for the Viewbar usage time clocked by their referrals and up to four level of extended referrals, with no limit on the number of referrals that one can invites to join AGLOCO. However, you will need to be as active as your referrals to get the maximum credit for referrals’ payable surfing hours, else you can earn up to your own earned hours only. The trick is that, instead of paying money or cash, AGLOCO will convert and pay the members’ accumulated monthly hours with shares of AGLOCO company stock, based on the concept that AGLOCO is 100% owned by its members. AGLOCO will issue share at the rate of one share per hour for Member hours and one quarter share for each referral hour (as of current conversion rate). AGLOCO plans to list on London Stock Exchange (AIM), so how much a share worth will all depends on market price or fair value of the share, which is directly dependent on AGLOCO’s profitability. AGLOCO says the profit is dependent upon its Members’ internet usage. However, as the greater the number of AGLOCO Members surfing the net with Viewbar for more hours, the more the shares will be issued to dilute the value of the existing shares, how the share price going to increase is rather speculative. If AGLOCO doesn’t manage to list on stock market, the shares or earned hours will most likely remain as virtual money. The only way to earn cash money from AGLOCO is when members respond or sign up for certain transactions with AGLOCO sponsor sites, or after the AGLOCO generates positive cash flow when they will be distributing the excess cash to shareholders and members. If you stay in countries that has legal implication or not so economy of scale to issue shares to you, you can expect to receive cash only if there’s public market for AGLOCO’s shares. If you believe the business model of AGLOCO will work so that you won’t waste your time surfing the Internet with AGLOCO Viewbar yet end up with only ‘virtual shares’, or you simply want to have a taste of how to earn easy money with dot-coms back in late 1990s, sign up with AGLOCO (defunct). Update 1: Agloco Viewbar available for download. Update 2: AGLOCO is scam, and ending operation.